Today David and I collected two Pogonomyrmex Subdentatus queens near Hollister, CA. Tomorrow I need to buy cotton balls so I can make up proper test tubes for them, a heat lamp so I can keep everyone warm enough (in one day I went from having 1 colony to having 9 colonies), and I need to install a shelf in my home where I plan to keep all my new ant friends. Edited by BugFinder, March 14 2015 - 11:04 PM. Nice! I do not believe we have these guys down here in Southern California. Such an early-flying Pogonomyrmex species. It was a strange day, we saw lots of their nests, but didn't see any of them flying. We just happened to see these queens out and about. I wonder if they either, weren't real swift and hadn't dug in like their sisters did, or finished digging and needed to eat and were out foraging. I would go with your second guess. 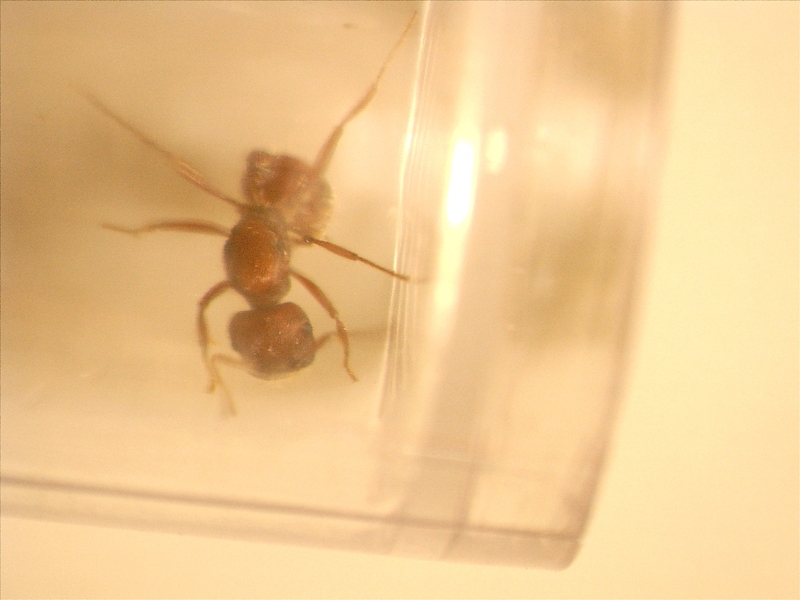 It's common to see Pogonomyrmex foraging for a week or two after they fly. So I put queen 1 in a talus, and queen 2 in a test tube inside the plastic outworld I got from Drew with my californicus colony. I've noticed queen 1 forages alot, It's hard to get photos of her because she moves so fast and almost never stops moving outside the nest. Queen 2, on the other hand, doesn't seem to move around much. Make sure you give them some raw seeds. I bought some raw honey from a local farmers market, and they love it. If you don't have honey, sugar water should work just as well. I gave them both poppy seeds and a cricket. 1 of my P. Subdentatus colonies has laid eggs. The other one hasn't laid any eggs that I can see, but she seems to be doing well too. I'm very happy these Pogonomyrmex seem to be doing well. Have they eaten the cricket? Mine (well, P. rugosus) never touched the crickets or fruit flies I offered. Yes, the crickets are long gone I need to serve another course tomorrow. On Friday last week my bud Tony brought me so more P. Subdentatus queens. Today a Talus arrived in the mail from Tarheel Ants, and I moved one of these five queens into that nest. This colony will from now on be referred to as Talus 3. I still have 1 queen in Talus 2, 1 queen in a test tube in a plastic box (I collected those two queens with my buddy David), and 4 more queens (that tony gave me) in individual test tubes awaiting boxes. I gave talus 2 and 3 a cricket today. Talus 2 dragged the cricket into her nest. Strange. Her eggs are outside the nests near the water tower. She appears to be doing well. Talus 3 hasn't touched her cricket yet. Looking forward to seeing her eat, I always consider that a sign of good health. Is the water tower where the only moisture is? THA suggests to also water the nest area and not depend on the water tower. I do that but have the tendency to over-water. I think the designs have have the water tower inside the nest are better. Do you cut up your crickets? Mine has never touched crickets or fruitflies for some reason. Be careful giving the Talus founding queens whole crickets. If they take it into the chamber, it could mold. I will only give my founding queens the cricket's hind legs if they are in Growth Chambers or test tubes. It is easier to retrieve uneaten pieces and clean any potential mold before it becomes an issue. For the Talus, you should consider pinning just the abdomen of the cricket to something like an eraser or piece of plastic and leave it in the foraging area. That way the queen can feed from it, but won't be able to drag it into the nesting area. I just learned that the hard way before I read your comment. A cricket has been dragged into one of the nests. now what do I do, lol. If the queen does not have any brood yet, you can move her into temporary housing and shake the cricket out. Otherwise you can buy a pair of long thin tweezers to remove it. I don't have a Talus because of this potential issue even though I really like the look, so I don't have any first hand knowledge with it. Maybe someone else on this forum can help. Sorry and good luck. She may drag the cricket out. If not then I would follow ToeNhi's suggestion of moving her for a few minutes and shaking the cricket out. As of today I have 4 of these colonies left. 2 in talus's (1 each of course), 1 in a dirt box (lol) that I bought from Drew, and 1 in a Biformica growth chamber. They all seem to be doing really well. I can't see much in the talus nests, so I can't see the brood (if any) but both talus queens seem to forage daily. The queen I put in the dirt box dug a founding chamber within a few hours of putting her in there and I haven't seen her since. I can't see her in her chamber. The cricket i put in there for her has gone uneaten, so I'm guessing she isn't foraging. I haven't noticed any brood in the biformica growth chamber yet.